When thinking of a story to share about my experience with USTOA in Taiwan, my first trip ever to Asia, there’s so much I could say. I could tell you about the overwhelming smell of stinky tofu, (which I did try, on camera…), the flashing lights, sounds and energy of the Shilin Night Markets–my favorite spot in Taipei. Or I could tell you about the first time I bit into a dumpling meticulously crafted by the world renowned Din Tai Fung at Taipei 101. Or maybe I could talk about joining in the groups of men and women practicing Tai Chi at 5am in the grounds of the Chiang Kai-shek Memorial Hall. There are so many stories to tell because the real, the in-your-face Taiwanese culture bombarded my senses in all the best ways. But the story I that I’m going to tell you is a very simple one. 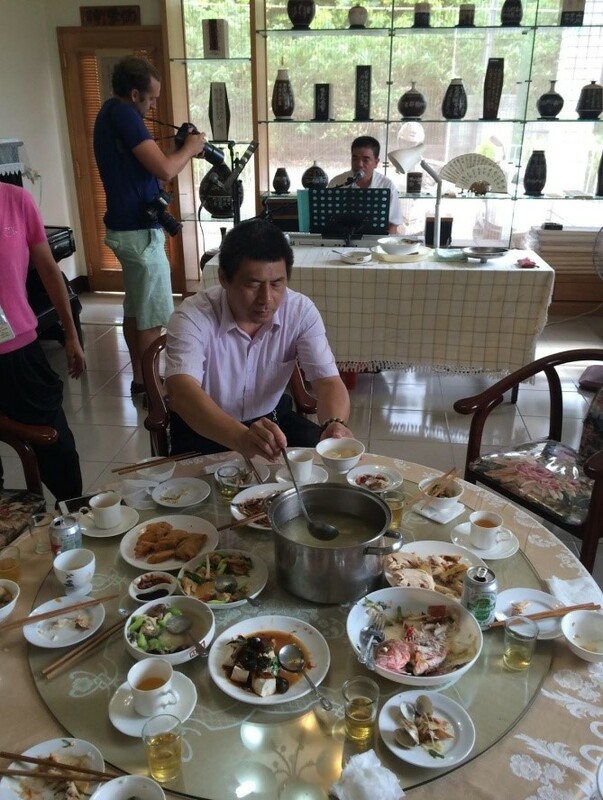 I’m going to tell you about eating lunch with Taiwanese family in the countryside. Our last day of our Ritz Tours excursion throughout Taiwan was a Sunday. Hours before our flights back home, we were invited to have lunch with nationally known calligrapher and his family at his home about 30 minutes outside of Taipei. We cruised along the highways of the pristine capital city, which I had felt comfortable in since it was so reminiscent of New York City, onto smaller roads through smaller villages and finally bumping onto ruddy, dirt roads twisting and turning around farms and creeks. 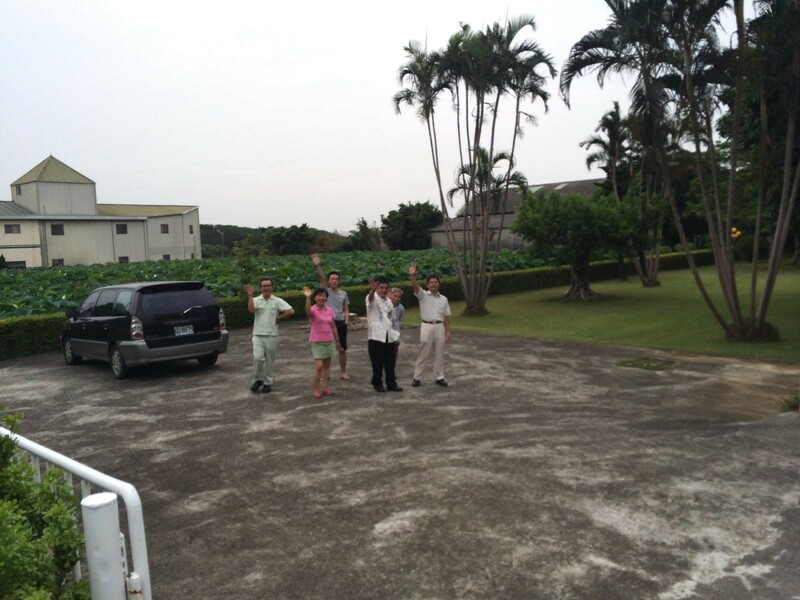 Our car came to a halt in front of large, angular white house next to a sprawling lotus pond. We were here. I had no idea where here was but I didn’t have much time to think before I was being bowed too and welcomed in broken English by our host, San. A stocky man, we followed him into the front room of his house with a low round table and about eight place settings. We were a group of four: my cameraman Justin, our driver, and our guide, Lily. Who else was coming to lunch? As it turned out, San invited a crowd of family and friends to join us in what was going to be one of the most memorable meals of my life. One by one, we met San’s family: his younger son who spoke English well, his older son who worked at Eva Airlines, his uncle who didn’t say a word, his wife who had been cooking this feast for two days, and his best friend who lived down the street. Smiling and nodding, his wife excitedly told us in Mandarin to sit down and start eating. San raised his glass and welcomed us, and we all toasted with a resounding hymn of “Gan bey,” which I later learned meant bottoms up. And the multi-course, multi-hour meal had begun. I can’t even tell you what was in the feast spread before us, but I dove into plate after plate of meats, chicken, seafood rolls, whole fish, and lots of rice, chopsticks first. 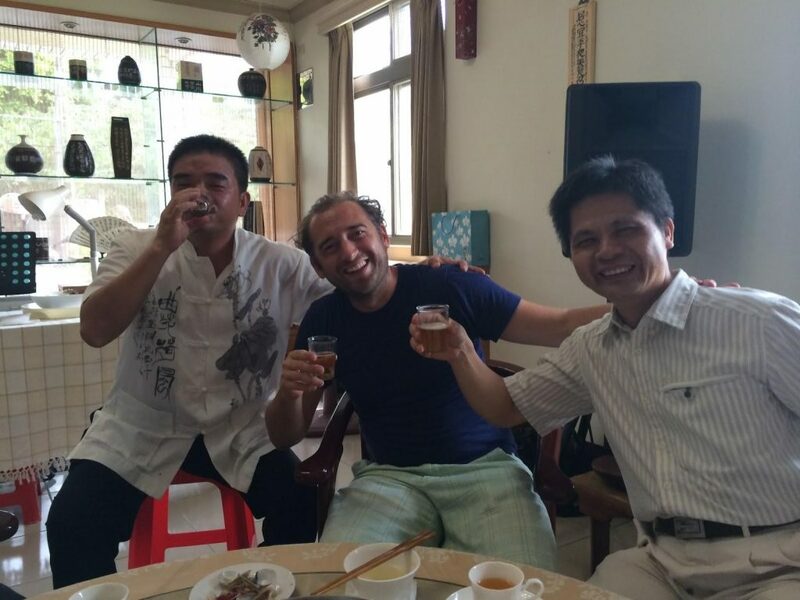 San told me that his wife was cooking in a traditional style of her ancestors in China–the flavors and spices were very traditional. I don’t think I could ever recreate any of it but, wow, was it delicious. After, several toasts later, and a lotus pod dessert, San decided that he needed to up the entertainment. Without saying a word, he walked over to his keyboard and started singing a Taiwanese song–which his friend eagerly joined in. 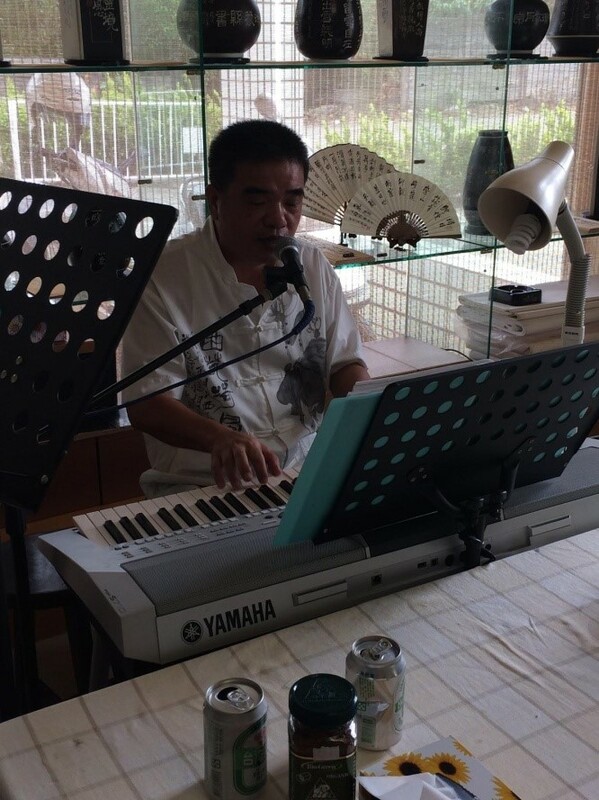 Being serenaded at luncheon feast in the middle of Taiwan’s countryside–I don’t think it could get any more local. The long lunch continued with more songs, more toasts and more chatter. As we all grew more comfortable with each other, I was able to communicate with his wife in spite of our limited mutual language. She eagerly showed me photos her daughter, which I deciphered studied fashion in Japan. We walked out and took a tour of their garden and admired their massive floating lotus pond–unlike anything I had ever seen. 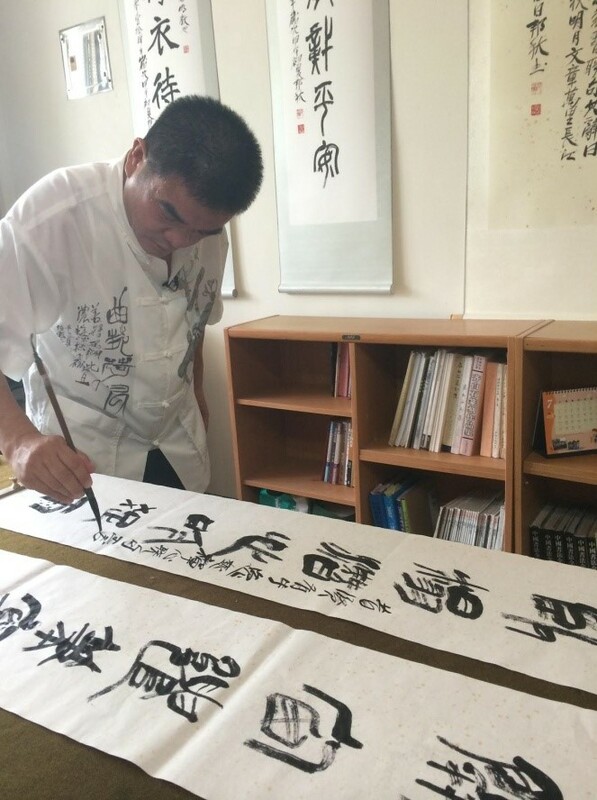 San said that beer made him an even better calligrapher and he proved it by giving us a tutorial in calligraphy. I got a one-on-one lesson, which I was told was very rare. With just black ink on the tip of a long haired brush, San flicked his wrist effortlessly to create beautiful swoops and slashes of the characters. He was a poet, and he made up several poems on the spot. 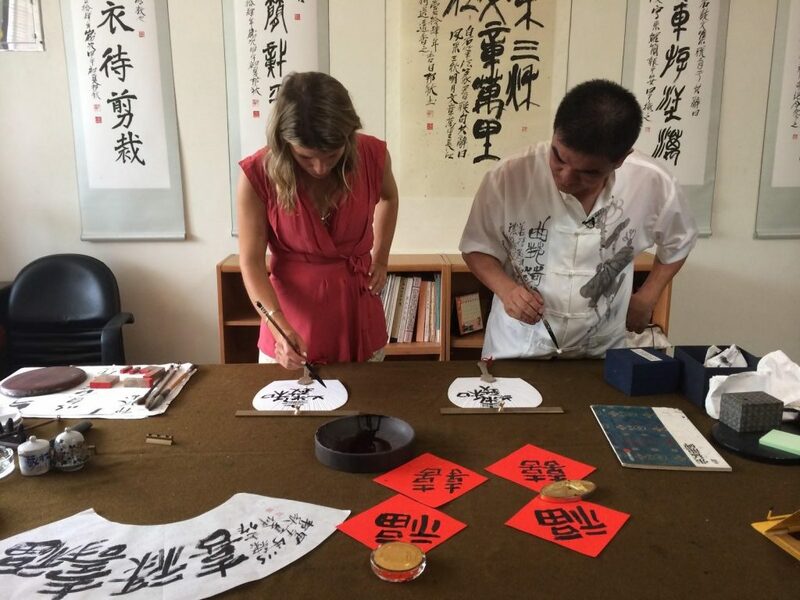 Calligraphy is part art, part storytelling and watching him create these fans and scrolls was captivating. 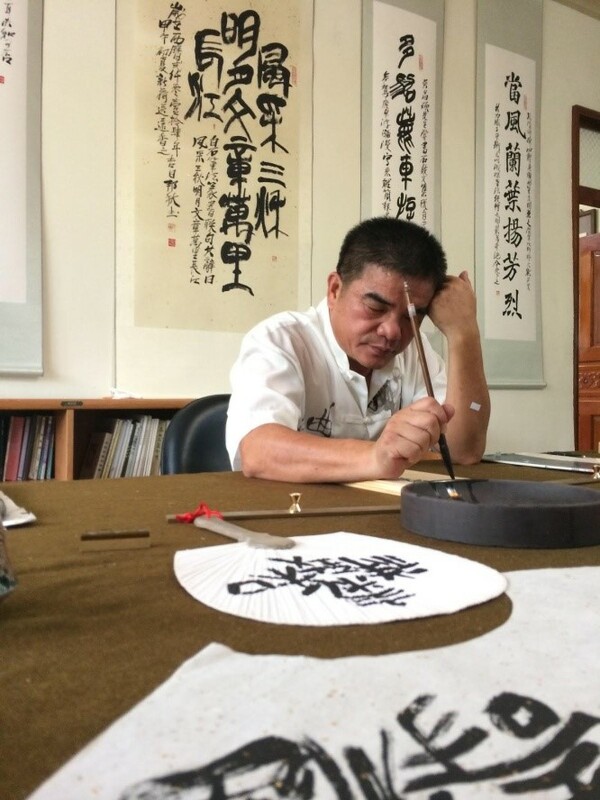 He had an impressive background–he had studied calligraphy all his life and now had become one of the most preeminent calligraphers in Taiwan. He told his it takes at least 50 years to really hone the craft–I can believe it as my attempts looked like child’s handwriting next to his beautiful characters. He even showed us his pottery studio in garage, where he molded, carved and fired beautiful, and expensive, vases. 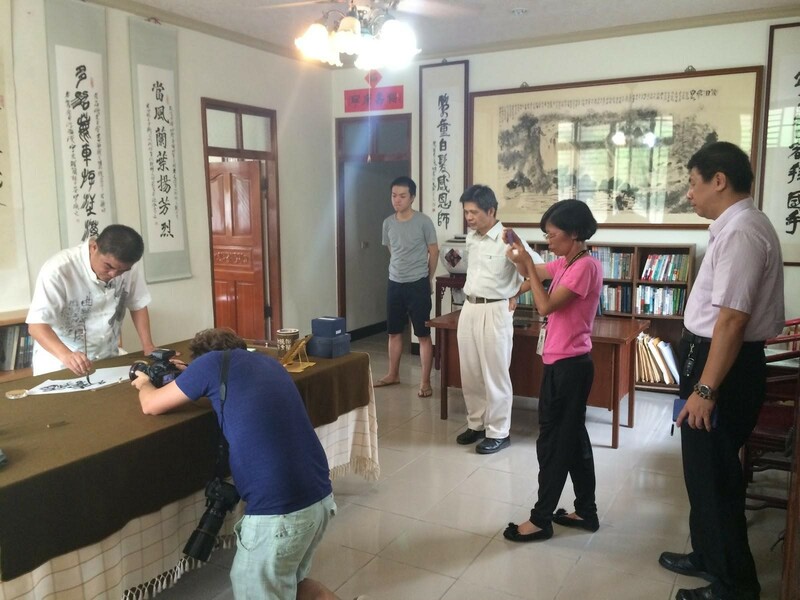 Not only did San and his family open up their home to us, he opened up his life and shared his life story. 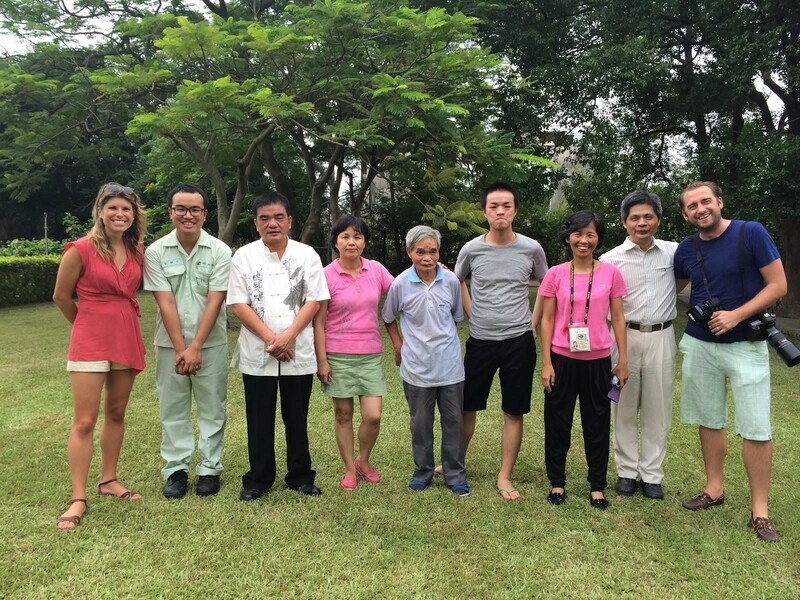 Being able to be in his home and experience his family dynamic, hear their stories and be part of their Sunday taught me more about Taiwan and it’s people than any pretty view or impressive site ever could. These are the types of moments that really affect your perspective and this unbridled generosity was so humbling. They lined up as we left and waved us off, as we bumped down the road away from them. For a moment in time, we were a part of their family and I’ll carry a little bit of that experience with me forever. Hospitality needs no language. Kelley Ferro is a travel expert & video journalist living in NYC. She films her show, Get Lost, around the world–hopping on a plane at least twice a month She is also the executive producer forTripfilms.com. For more on her travels, follow Kelley’s Facebook page.